Dixon woke us before dawn. It was cold and dark, but the hot coffee he left with us helped get us moving. Heidi and I have done several backpacking trips together so we were familiar with the routine of breaking camp. However, we are not typically early risers, and we were unaccustomed to being on a schedule. The morning packing of our duffels felt rushed and stressful, but we managed to finish relatively quickly compared to the rest of the climbers. This afforded us time to catch the sunrise with our cameras and still have a relaxing breakfast. An early bird for a change, I was able to spend a few minutes socializing with other climbers while I waited for breakfast. Heidi became BFFs with Dixon, the expedition waiter, and got to wear his wolf hat. 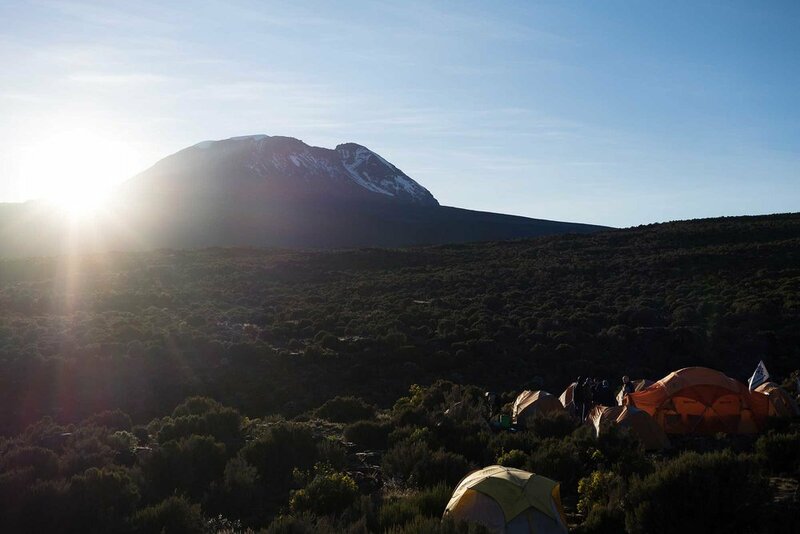 While the team finished packing up, I caught the sun popping up over Kibo and bringing some welcome warmth to our camp. As our group slowly progressed across the mostly flat plateau, Andrew stopped us for ecology lessons. I was amazed by how much he knew about the flora and fauna. Sadly almost none of it stuck in my head. As much as I tried to pay attention, the specifics of the various plants held zero interest for me. I do remember being amazed when he told us that many types of animals journey up to the plateau to feed. Something about the salts and minerals they are able to find here. Unfortunately, I don't even remember what species he mentioned. I was a terrible student, but I already had some low-grade summit fever, so I patiently listened and then promptly forgot it all. The topography of the plateau was perforated by blobs of lava rock, and an odd boulder or two. I couldn't help but imagine the cataclysmic series of events that located each of these boulders. Was it a massive eruption that blasted these rocks into the air, causing them to plummet into their current location miles from the crater? What was it like when these large rocks came shooting out of the sky? 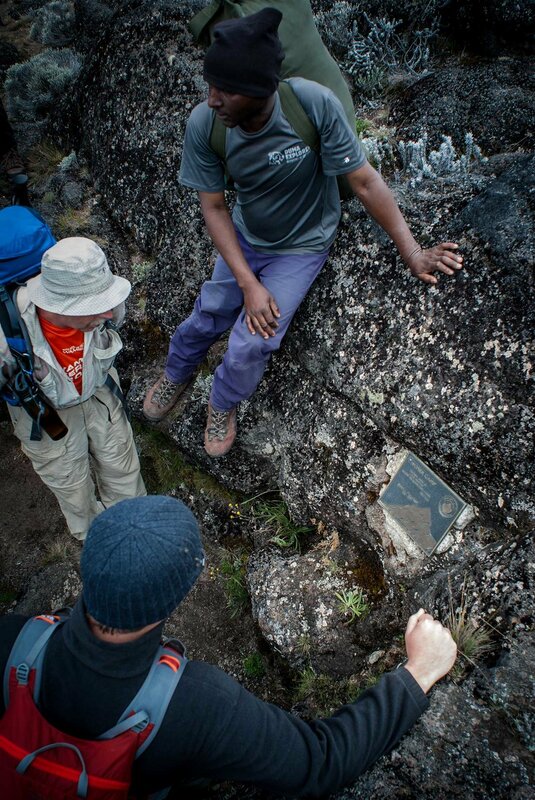 Was the plateau solidified? Was it still a magma flow? Are some of the smaller boulders just the tops of larger, round boulders that are submerged in the volcanic soil? This was far more interesting to me than the various species of plants we encountered. Sadly nobody had the answers. Like clockwork, the afternoon clouds rolled in as we began our climb off of the plateau. Once we cleared the scrubby vegetation of the Moir land, the rest of the day would be spent hiking through blobs of long since cooled lava in a landscape that was increasingly lunar in appearance. We took a brief break near the Scott Fischer memorial plaque commemorating the famous mountaineer who perished on an Everest expedition. Though a different mountain, it was a sobering reminder that there are severe risks involved when venturing into cold, remote locations at altitudes that push humans to their survival limits. We would not be going nearly that high, but there would still be risk to be managed. I know from experience that I tend to feel the impact of altitude around 12,000 feet, and we were now climbing higher than this. The night before I had taken my first dose of Diamox, a medication to help one cope with altitude-related issues. One of the side effects of Diamox can be a numbness or tingling sensation in the limbs. By midday, I was feeling an epic amount of tingling in my arms. From the shoulder down my arms both felt as if they'd gone asleep. I tried in vain to solve the problem by loosening my shoulder straps to regain circulation, but the peculiar tingling wouldn't go away. I eventually had to learn to ignore it. The lava spire on the far left of the horizon was the peak of our acclimatization climb for the day. 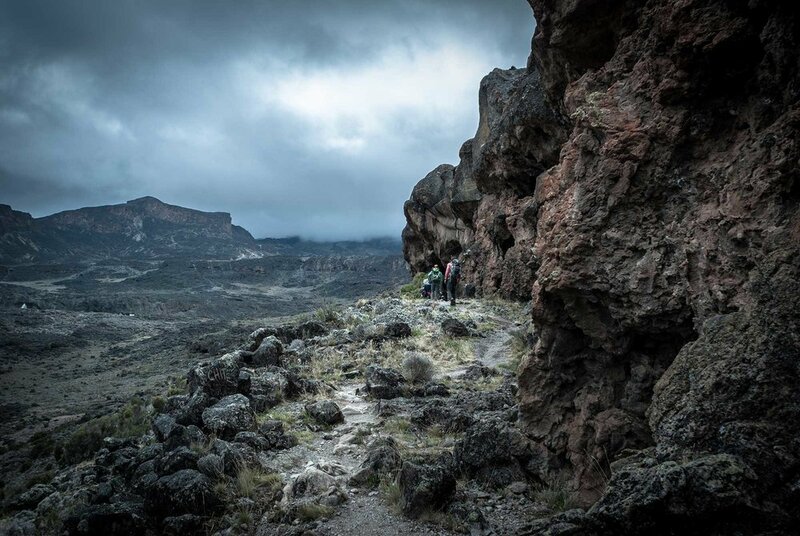 One of the best ways to acclimatize to high altitude is to take your time, increasing your elevation slowly. This is the reason we opted for an eight day route. 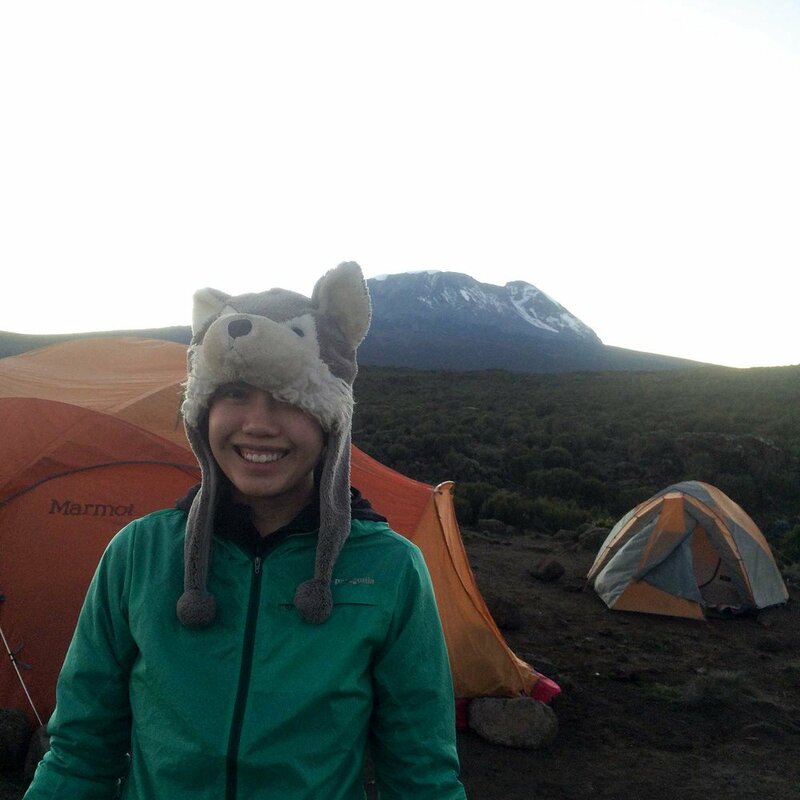 To increase our chances of successful acclimatization, Duma Explorers has us hike high and sleep low. 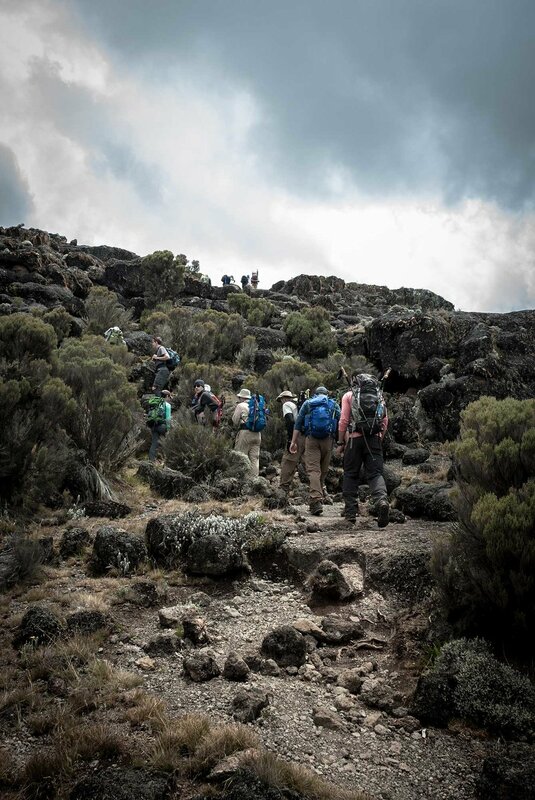 Each day we hiked to an altitude about 500-1000 feet above our sleeping location. This evening we arrived in camp, dropped our pitifully light packs and continued up a lava spire for several hundred more feet before descending back to camp. This bump in elevation helped force our bodies to create more red blood cells to better absorb the lower amounts of oxygen found at elevation. I knew altitude would hit me at some point on the trip, so I took it nice and easy ascending the lava spire. On the way back down, my luck ran out. It began as a mild headache. By the time we pulled into camp, I went directly to my tent and got horizontal. The call for dinner came and I groaned in discomfort. In addition to the headache, a profound nausea had kicked in. Nausea is my kryptonite. It is extremely hard for me to push through it even when it is mild. This was not mild, and I now had to eat. Our guides kept a tight watch on us. They measured our blood/oxygen levels twice per day, engaged us in conversation to monitor mental functions, and closely monitored how much food we were consuming. 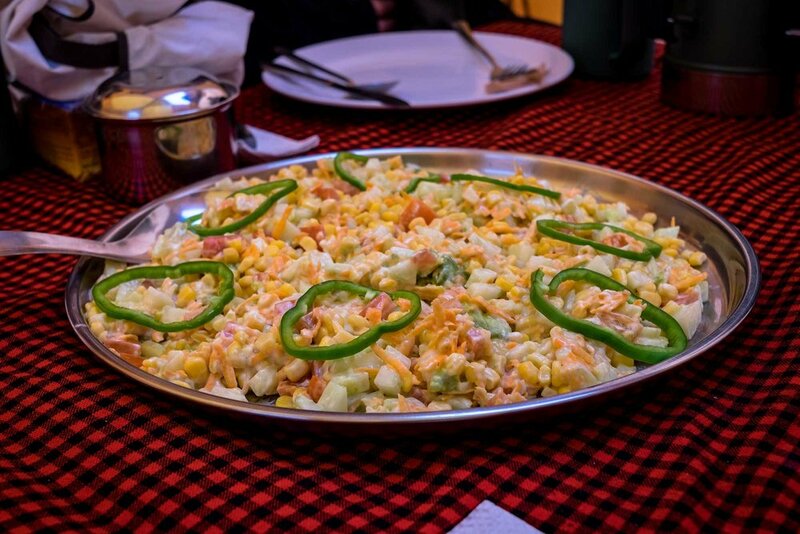 They quickly noticed that I was nibbling small portions — a dead give away that something was off. I knew that I would have to find a way to get as much food down as possible. If I didn't, I would draw increased scrutiny from the guides and more importantly, not have the energy to hike in the coming days. I managed to eat only a measly portion of each. I slowly worked on my food, nibbling a few bites and waiting for a fresh round of nausea to nearly bring it all back up. Ultimately, I was able to finish a modest portion of dinner without losing any of it. Heidi and I brought ginger candy to help with nausea, and I began hitting that stash hard. 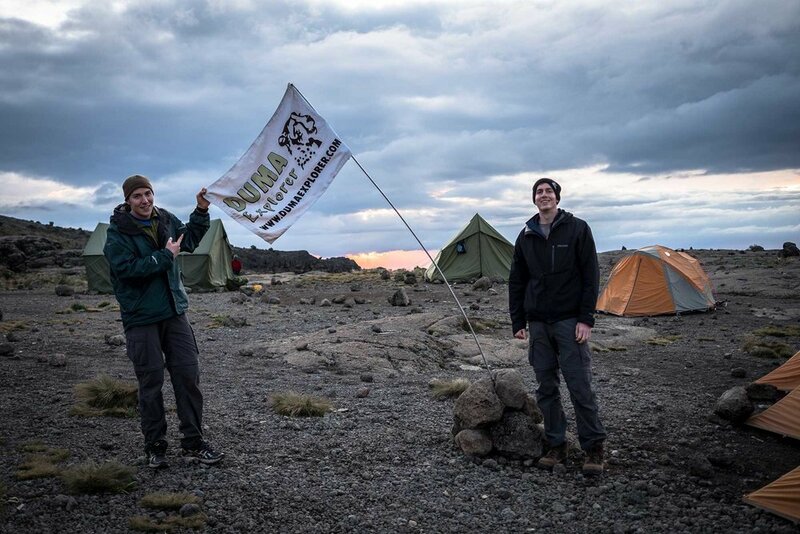 After dinner, I went straight to bed, but not before catching Doug and DJ, two young climbers from our group, horsing around with the Duma camp flag. These guys were a riot. They had an adorable rivalry with one another and were always picking on and pranking one another. As it did the night before, Kibo poked out of the clouds shortly before the the sun set. I drifted off to sleep hoping that I would feel relief by the morning, and knowing that even if I did, by the afternoon, the symptoms would likely return. 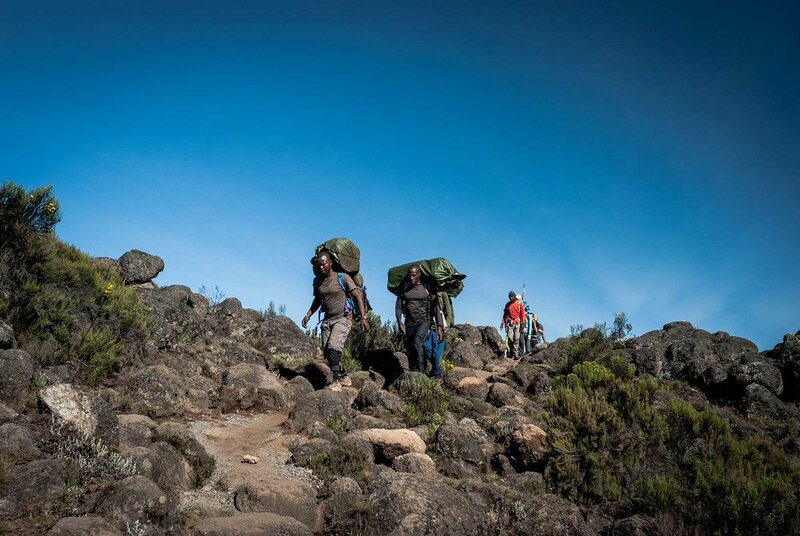 Only 20% of those who attempt to climb Kilimanjaro make it to the summit. I hoped that I had what it took to be in that small group that successfully summits. Is story time boring you? 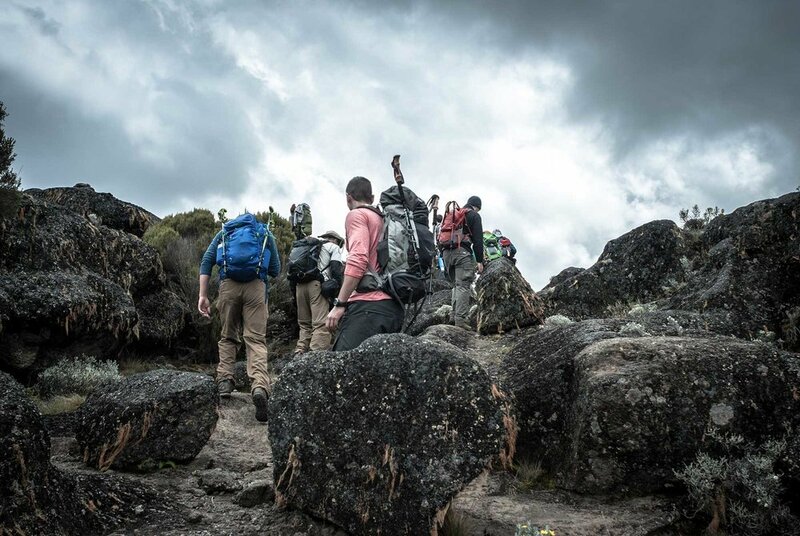 Check out the Kilimanjaro Trip Page. 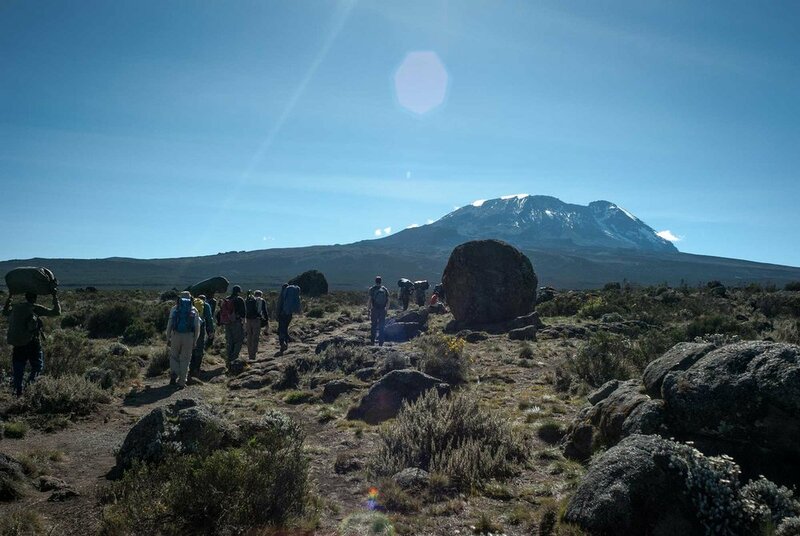 Welcome to the third day of our eight-day Kilimanjaro climb. If you’re just tuning in, you may want to start at the beginning of the adventure. 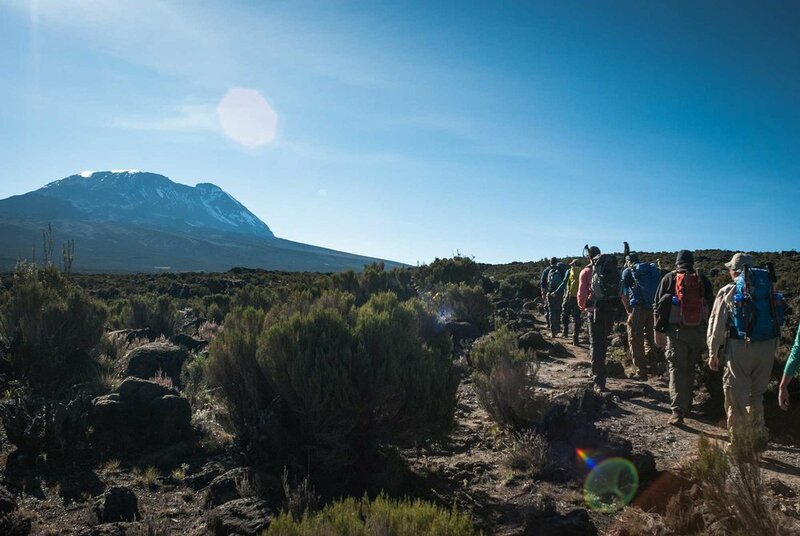 If you're interested in someday climbing Kilimanjaro, check out the main Kili trip page which has links to additional information and resources. 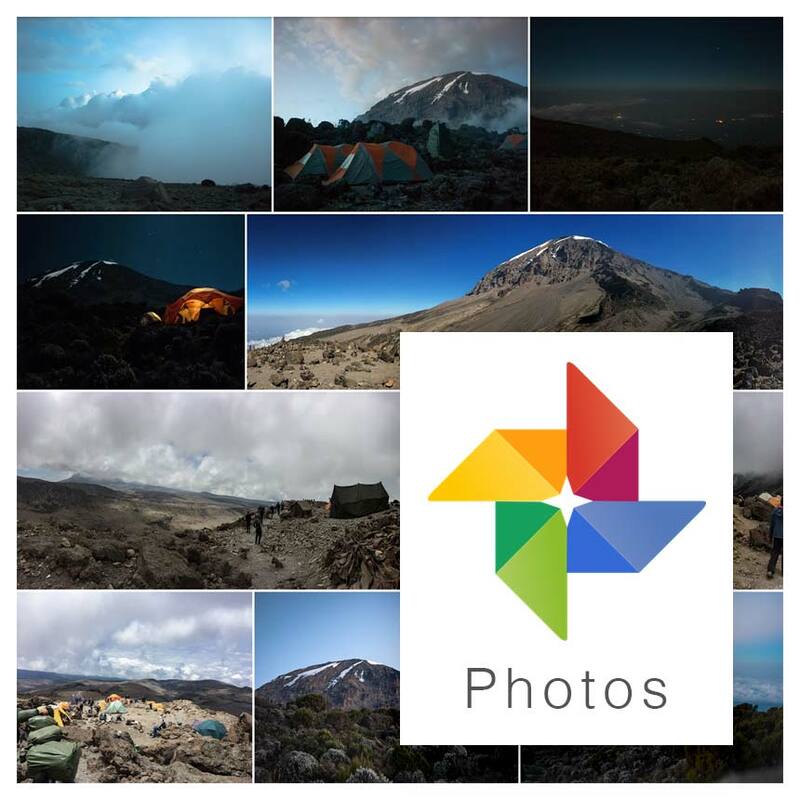 If photos are your jam, head over to my Google Photos gallery.